Why choose Aldersley High School? Firstly, because our children are amazing! Last year they achieved a Progress 8 score of 0.51 which is well above average and puts us in the top 4 schools in the Black Country. We passionately believe in our Knowledge-rich curriculum and pre-planned curriculum lessons have reduced teacher planning time. Over many years we have proven that feedback is important to students but through adapting teaching and not arduous marking, hence we do not mark. All of our staff have a coach that works with them throughout the year which negates formal lesson observations and onerous quality assurance and ensures that they have the CPD that they need for career progression. Our conduct system is centrally managed and with a team of highly qualified non-teaching pastoral staff. Graduates are welcome to apply and join either our two-year Graduate Teacher Training Programme or our PGCE route into Teach First. Come and visit our school at any time and look at our plans for the new Amethyst Sixth Form building which will be ready for September 2019. ‘I love working in the PE department at Aldersley High School. The students are amazing and we have excellent attendance for all of our after school activities. I joined the school as an NQT and was talent spotted early in my career. After completing Teaching Leaders with Ambition Schools, I was promoted to Attainment and Standards Leader for Year 7 and transition lead. 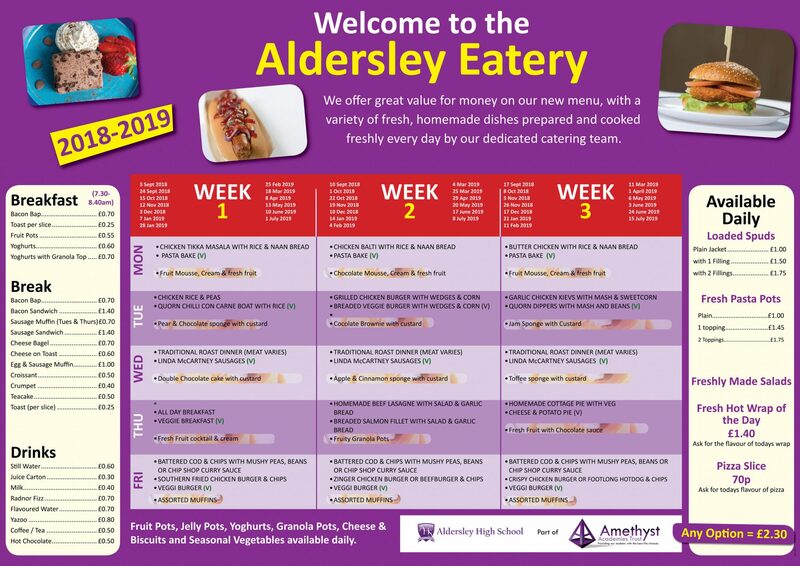 Food and Catering is an extremely popular subject at Aldersley and I have always felt very lucky to teach pupils who are so enthusiastic and motivated. It is a wonderful working environment and I value the autonomy that we are given to plan out a curriculum that we feel best suits our pupils. Results within the department are very good, and rising every academic year. In fact, almost 50% exceeded their target grade in 2018. We are a small, but ambitious department, and would welcome a new team member to help us continue to drive our attainment even higher. ‘I love working in the MFL department at Aldersley. The knowledge rich curriculum and collaborative working ensures our work load is manageable and students make excellent progress. The majority of our students study French or Spanish which means languages are integral to the curriculum. Personally I started as an NQT and have been offered so many opportunities and currently I’m Asssisant Head. Come and join our amazing team’. ‘I have worked at Aldersley High school for 7 fantastic years and I can honestly say it is a truly wonderful place to work. The knowledge-rich curriculum allows you to really be an expert of your subject and the outstanding progress of our students reflects the effect this has had. I began my journey as a GTP student here and quickly gained promotion to become an Attainment and Standards Leader and now Assistant Headteacher . Don't miss this opportunity to join our Aldersley family’.